This happens every time Apple announce a new product category. Audience reaction, and the press, rush off to praise or condemn the new product without standing back and joining the dots. The Kevin Lynch presentation at the Keynote also didn’t have a precursor of a short video on-ramp to help people understand the full impact of what they were being told. With that, the full impact is a little hidden. It’s a lot more than having Facebook, Twitter, Email and notifications on your wrist when you have your phone handset in your pocket. 1. Returning home at the end of a working day (a lot of people do this). First thing I do after I come indoors is to place my mobile phone on top of the cookery books in our kitchen. Then for the next few hours i’m usually elsewhere in the house or in the garden. Talking around, that behaviour is typical. Not least as it happens in the office too, where if i’m in a meeting, i’d normally leave my handset on silent on my desk. With every Android or Tizen Smart Watch I know, the watch loses the connection as soon as I go out of Bluetooth range – around 6-10 meters away from the handset. That smart watch is a timepiece from that point on. Now, who forgot to notice that the Apple Watch has got b/g WiFi integrated on their S1 module? Or that it it can not only tell me of an incoming call, but allow me to answer it, listen and talk – and indeed to hand control back to my phone handset when I return to it’s current proximity? There are a plethora of Low Energy Bluetooth sensors around – and being introduced with great regularity – for virtually every bodily function you can think of. Besides putting your own fitness tracking sensors on at home, there are probably many more that can be used in a hospital setting. With that, a person could be quite a walking network of sensors and wander to different wards or labs during their day, or indeed even be released to recuperate at home. Apple already has some sensors (heart rate, and probably some more capabilities to be announced in time, using the infrared related ones on the skin side of the Apple watch), but can act as a hub to any collection of external bluetooth sensors at the same time. Or in smart pills you can swallow. Low Energy Bluetooth is already there on the Apple Watch. That, in combination with the processing power, storage and b/g WiFi makes the watch a complete devices hub, virtually out of the box. If your iPhone is on the same WiFi, everything syncs up with the Health app there and the iCloud based database already – which you can (at your option) permit an external third party to have access to. Now, tell me about the equivalent on any other device or service you can think of. The iPhone 5S, 6 and 6 Plus all have integrated finger print scanners. Apple have put some functionality into iOS 8 where, if you’re within Bluetooth range (6-10 meters of your handset), you can authenticate (with your fingerprint) the fact your watch is already on your wrist. If the sensors on the back have any suspicion that the watch leaves your wrist, it immediately invalidates the authentication. So, walk up to a contactless till, see the payment amount appear on the watch display, one press of the watch pays the bill. Done. Now try to do that with any other device you know. There are probably a million other applications that developers will think of, once folks realise there is a full UNIX computer on that SoC (System on a Chip). With WiFi. With Bluetooth. With a Taptic feedback mechanism that feels like someone is tapping your wrist (not loudly vibrating across the table, or flashing LED lights at you). With a GPU driving a high quality, touch sensitive display. Able to not only act as a remote control for your iTunes music collection on another device, but to play it locally when untethered too (you can always add bluetooth earbuds to keep your listening private). I suspect some of the capabilities Apple have shown (like the ability to stream your heartbeat to another Apple Watch user) will evolve into potential remote health visit applications that can work Internet wide. Meanwhile, the tech press and the discussion boards are full of people lamenting the fact that there is no GPS sensor in the watch itself (like every other Smart Watch I should add – GPS location sensing is something that eats battery power for breakfast; better to rely on what’s in the phone handset, or to wear a dedicated bluetooth GPS band on the other wrist if you really need it). 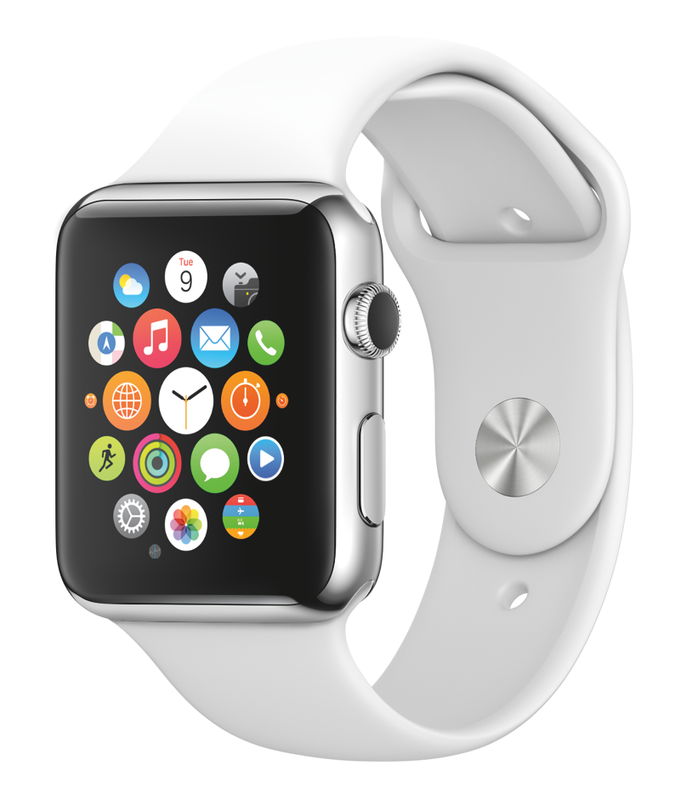 Don’t be distracted; with the electronics already in the device, the Apple Watch is truly only the beginning. We’re now waiting for the full details of the WatchKit APIs to unleash that ecosystem with full force.